Nifty opened positive on good global cues, but was sold off from the word go with the index dragging slowly below the previous day’s close to end the day at 5322.95 a smallish loss of 15.05 points. The four day winning streak got broken today but the Bears were unable to make much of an impression. For a change the Option Table today saw huge addition at 5400 and 5700CE levels with 5400 now looks like super resistance. 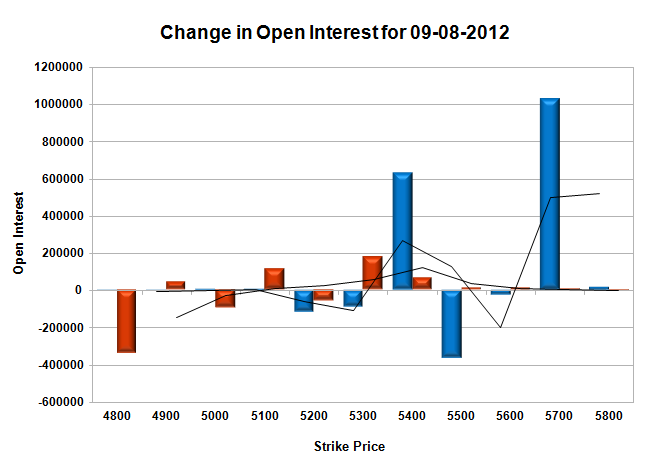 Call option 5400, 5700 added 16.6 lacs huge amount of OI, with huge liquidation seen at 5300 and lower strike prices. 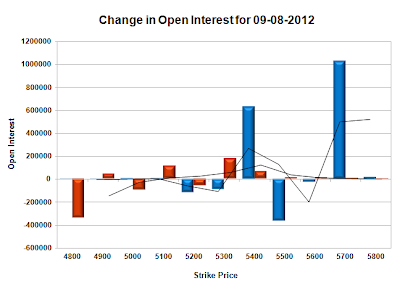 Put Option 5400-5300, 5100 added 3.58 lacs huge amount of OI, with profit booking seen at 4800 and lower strike prices. 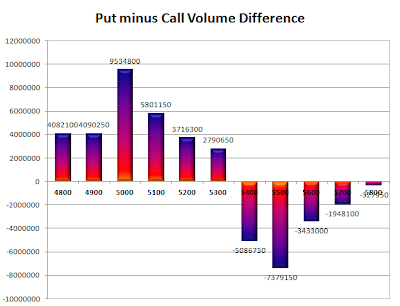 Highest accumulation on Call option 5500 at 85 lacs & 5400 at 77.5 lacs whereas Put option 5000 at 1.06 Cr & 5100 at 76.4 lacs. 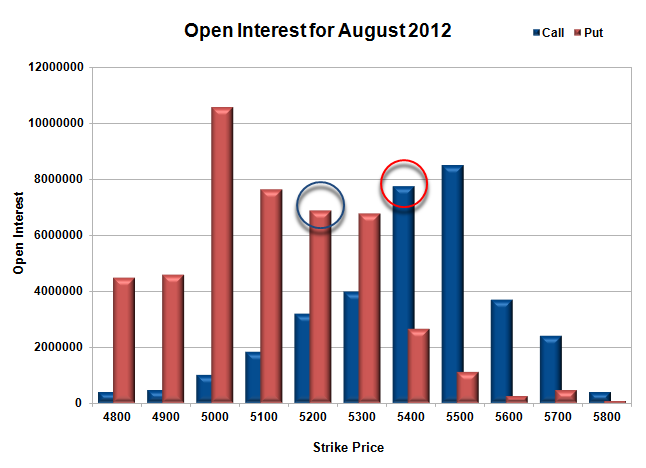 Nifty Open Interest is at 2,39,63,900 up by 2,71,150 with decrease in price, most probably huge short build-up. Bank Nifty Open Interest is at 22,46,925 down by 28,025 with decrease in price, most probably long liquidation. FII’s bought 1.59 lacs of Futures, most probably long addition, as their OI also increased by 4.71 lacs, and their average price per contract comes to around 5134. FII’s future open contract as on date is 6.07 lacs. PCR Open Interest (Volume) has just gone down to 1.491 due to huge profit booking at 4800PE level. Initial support is still very much at 5300 with some more addition today with OI now at 67.8 lacs, and below that at 5200PE with OI of above 69 lacs. Resistance just got better at 5400 with huge addition of 6.3 lacs with net OI now above 77 lacs and above that at 5500 with OI above 85 lacs. Range as per Option Table is 5275 -5378 and as per VIX is 5277 - 5368 with 5320 as the Pivot.